100 Rolls Wholesale Bulk Lot of Donald Trump Toilet Paper-USA SELLER. Each and every roll printed on each sheet. Take A Dump With Donald Trump! We Know You Want To Dump On Trump! Here's To You Mr. Donald T. Rump! This toilet paper Trumps all the rest. The Donald. Love him? Hate him? Either way... you'll love this Donald Trump Funny Toilet Paper. Trump's face on EVERY sheet! Super Absorbent! These collector's Donald Trump Toilet Paper rolls are printed on high quality sheets with environmentally friendly soy based ink. (Someone has to care, right?) The Donald's puckering mug is shown on EVERY sheet and won't smear or smudge. Each roll is shrink wrapped (new and unopened). We can tell "You're Fired" up about this toilet paper so stock up before you get short-sheeted. The reactions are PRICELESS (or slightly close to four billion dollars' worth*). * per sheet Remember, Election Day may come and pass but you'll always need to wipe your a$$! We also sell Hillary Clinton toilet paper and Obama Toilet Paper in many versions. Including our Obama LAST DAY toilet paper and our newest Toilet Paper HILL- BILLY Hillary Clinton and Bill Clinton together on one roll. NOT AGAIN! Trump is such a big mouth that this toilet paper is perfect. 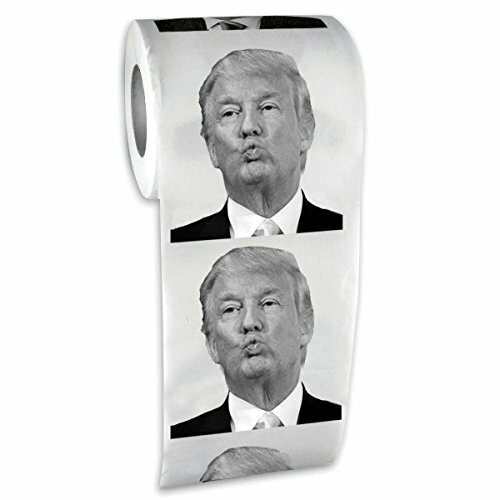 100 ROLLS EACH ORDER-You will get 100 rolls of Donald Trump Toilet Paper in each case. Collectors Item for those who like political gifts. Our Donald Trump Toilet Paper is of the best quality and printing. Our Donald Trump Toilet Paper goes great with the Trump Talking Pen or our Trump Talking Sound Button or Trump Last Day Clock, countdown clock.. If you have any questions about this product by TheGag, contact us by completing and submitting the form below. If you are looking for a specif part number, please include it with your message.